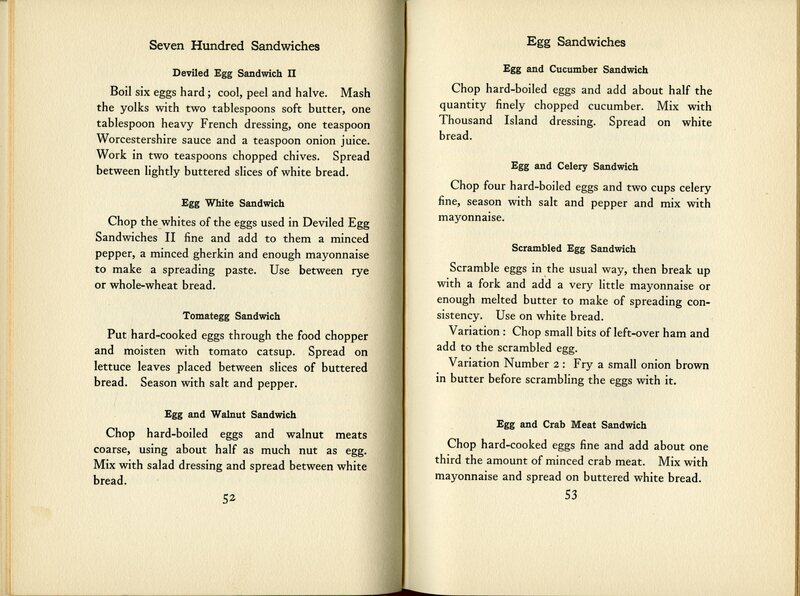 eggs – What's Cookin' @ Special Collections?! There are several simple ways of cooking eggs which are very commonly followed. Thus, the egg in the shell is cooked by immersion in hot or boiling water or is less commonly roasted. After removal from the shell, the egg is cooked in hot water or in hot fat. In the latter case it may or may not be beaten or stirred. Combined with other materials to form various made dishes, eggs are boiled, baked, steamed, or fried, as the case may be. The total number of methods of serving and preparing eggs is very large, but in nearly every case is will be found that the method of preparation is only a more or less elaborate modification of one of the simple methods of cooking. 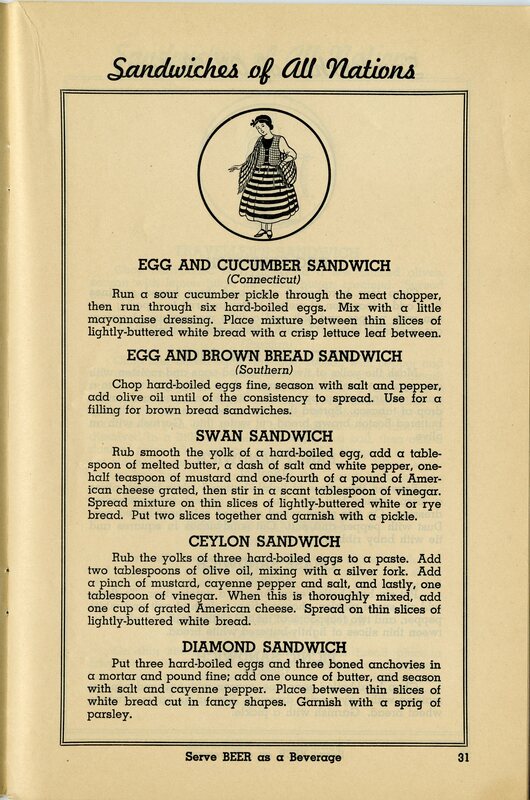 From Langworthy, C. F. Eggs and Their Uses as Food. Farmer’s Bulletin No. 128. Washington, DC: U. S. Department of Agriculture, 1905. On Catering, Quality, Chickens, Eggs, and More! This week’s post may not answer the question of which came first, but it does have a great day to say about quality chickens, eggs, and other poultry–not to mention meats, salads, and pastries. Title page and picture of the building. 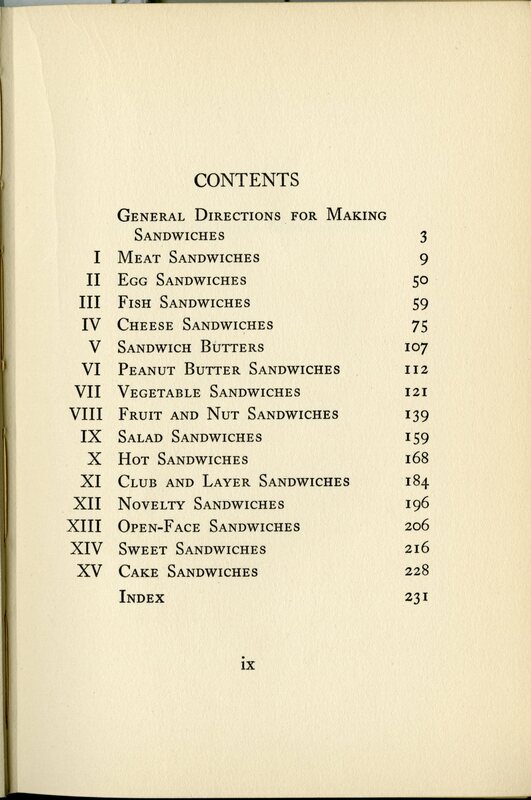 The title of this publication, in full, is John Hill’s Book: The Culinary Art as Applied to Catering, Including an Abridged List of Cooked Articles Available for Home Service (c.1929). If that isn’t quite clear, don’t worry. Even once you unravel it, the contents aren’t quite what you might think. The title suggests is might be a catering menu–which it is. But that’s not all it is. It’s also a short treatise on quality ingredients, an advertisement for catering services, and, one might argue, a collection of food management/storage hints. Most of right hand pages include some examples of items the caterer can provide. We see a wide range of foods, from cakes and pastry to sandwiches and salads. 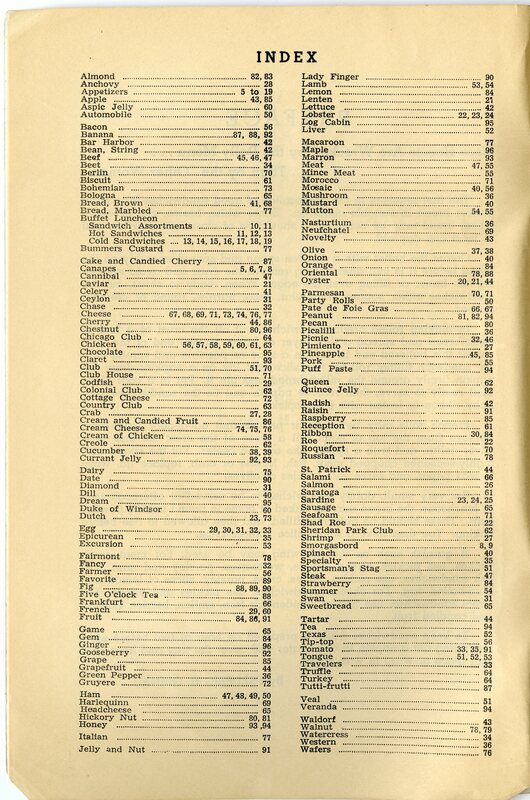 However, we are informed that this is only a small fraction of what the company can provide, though listing the full range “would be burdensome for [the company] and confusing to you, were we to list them all.” One wonders how a catering menu might prove confusing for potential clients–perhaps it’s because, as the publication later states, they have no “‘regular’ or stereotyped menus.” At the very least, it’s clear John Hill prefers to meet in person. The photographs of the business certainly suggest a desire to show off the fine supplies and capabilities it can provide. Another portion of the text is taken up by a series of mini-essays on quality ingredients. On the one hand, they are a chance to talk about the high quality of foods used by the company in their catering efforts: “We will not talk bout eggs in the abstract, but of John Hill eggs, about which there is nothing abstract” and “There is no chicken quite like ours.” The publication also touches in kitchen processes and technology, spending two pages on cold storage and the disservice it does. But freezing does more than ruin the flavor of meat and poultry–it is conceivably responsible for the prevalence of dyspepsia and kindred ills among Americans–so, if you want to avoid dyspepsia, avoid frozen foods. Perhaps most striking about this publication, though, is the quality of the item itself. It may not be obvious from the scans above, but this is by no means ephemeral. It has a nice paper cover, with a paper dust jacket, and large photos. It appears to have been printed on handmade paper that was folded, and the edges were not cut smooth. Was it merely a way to attract a certain caliber of customer? Was it intended to be something more than just an advertisement? Were the tidbits on quality meant to be taken as hints for the everyday household? 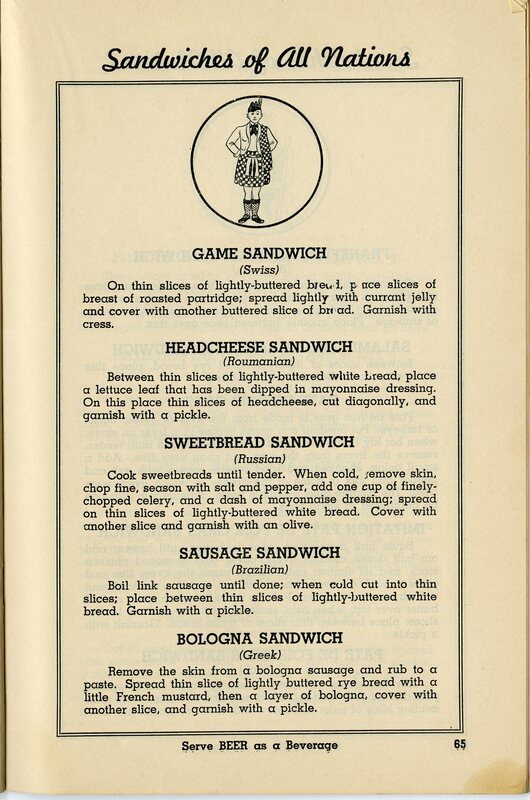 Unfortunately, we don’t have answers to those questions, but John Hill’s Book, with its mix of advertising, lecturing, and menus makes for a unique addition to the History of Food & Drink Collection. Oh, and just remember, “Speed is as incongruous in good cooking as it in in a good golfer’s game of golf.” Or if you prefer fashion metaphors to sports, menus should be “just as special as the dresses of the most fashionable couturiere.” Whether you’re cooking, eating, or both, the point is, take a little time and enjoy something special this week. 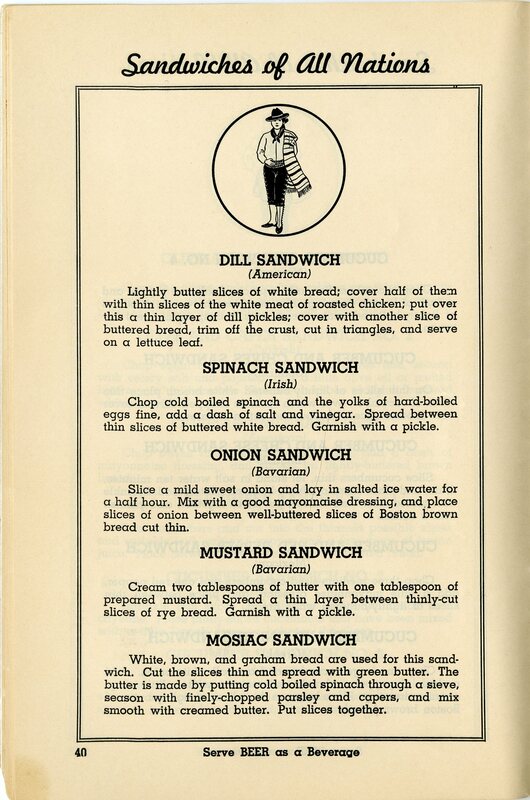 As you may recall from last week, it’s National Sandwich Month. To wrap-up (pun intended) August, we have a wonderful pamphlet with nearly 100 pages of international sandwich delights. 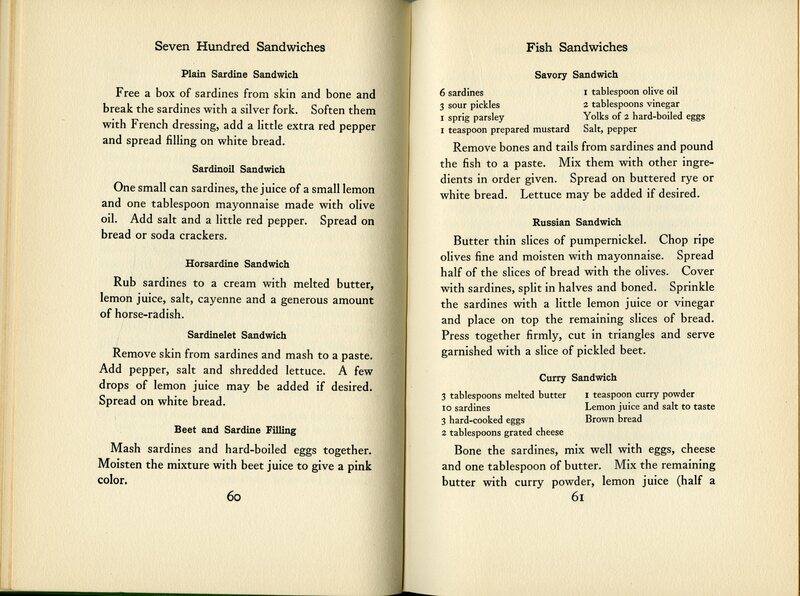 Well, nearly 100 pages of international sandwiches, at least. 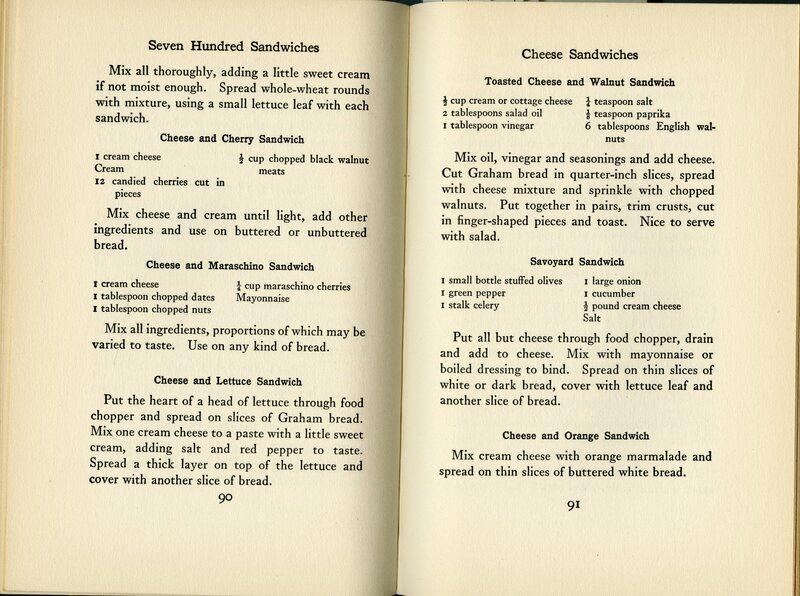 This week, we present Frederic Girnau’s Sandwich Book of All Nations: Over 300 Ways of Making Delicious Sandwiches, Appetizers, and Canapes by Ruth Elizabeth Mills, published c.1945. Amazing what you can do with a couple pieces of bread and just about anything you have lying around…Even if you don’t have a traditional filling. 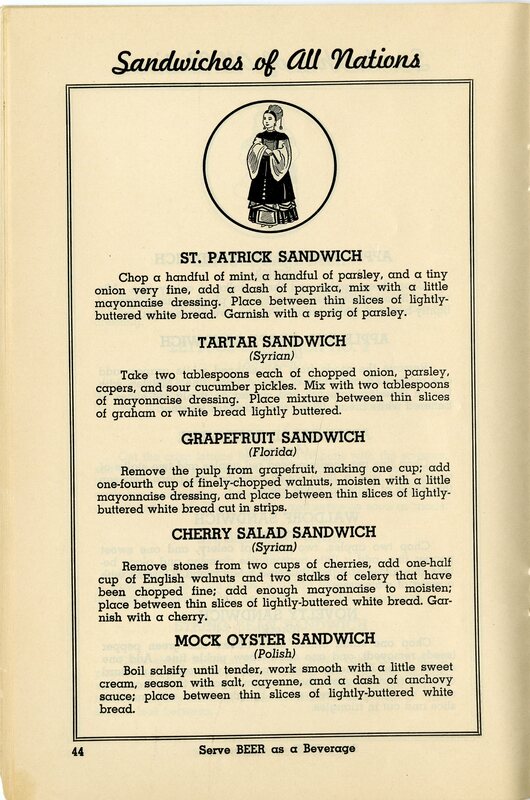 Just make a sandwich of bread and tartar sauce or pieces of fruit! In addition to the ones above, there is a whole page on cherry fillings, as well as other citrus fruits, dates, and prunes. 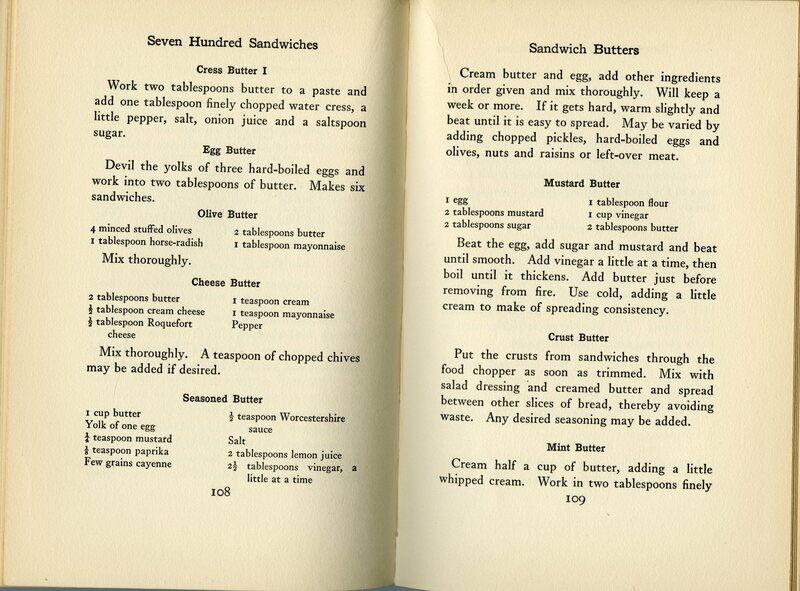 If you’re seeking the more unique, there’s homemade peanut mayonnaise, tomato jelly, cream cheese and beet, or nasturtium sandwiches. 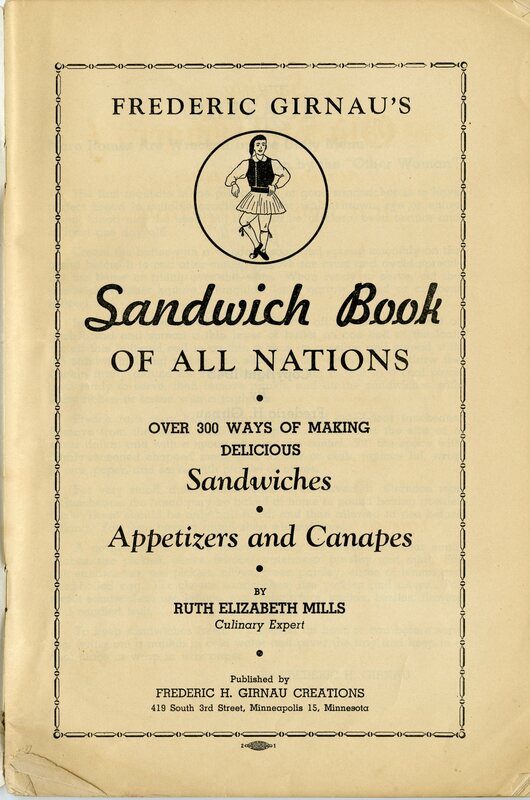 Our copy of Frederic Girnau’s Sandwich Book of All Nations: Over 300 Ways of Making Delicious Sandwiches, Appetizers, and Canapes is one of about 5 in public and academic library hands and is well worth a glance or two. The Frederic Girnau referenced in the title was actually the publisher and Mills wrote several books the company during the 1940s. 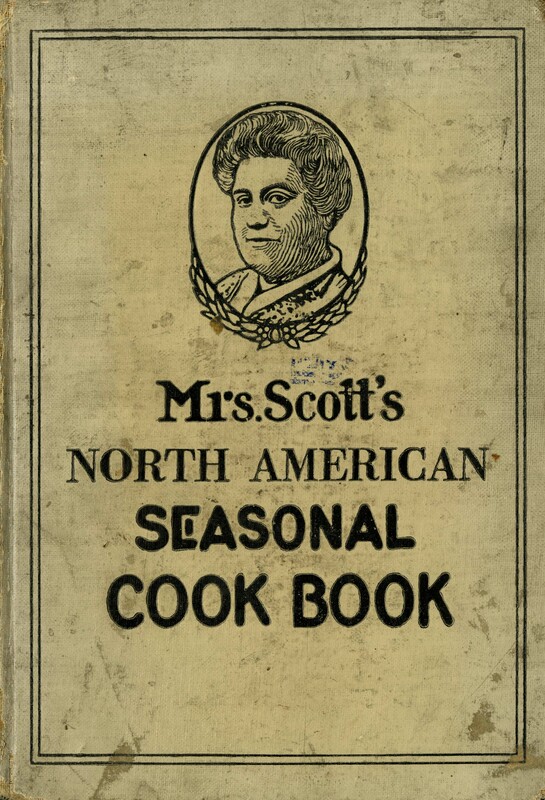 She authored two books on preparing seafood and fish and game and waterfowl the “sportman’s way,” as well as pamphlets on cookies and international foods. 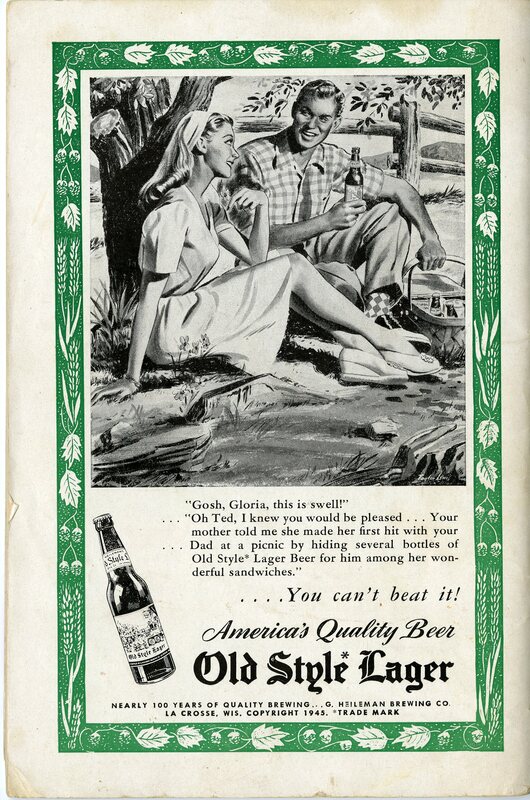 Because nothing says “let’s picnic” more than a swell mustard-and-bread sandwich and an icy cold beer! Until next week, when we give up bread and meat for some children’s adventures in the kitchen, keep making those sandwiches. August is National Sandwich Month! (It’s best not to ask how I know things like this…) My plan for this week was to feature several different items. 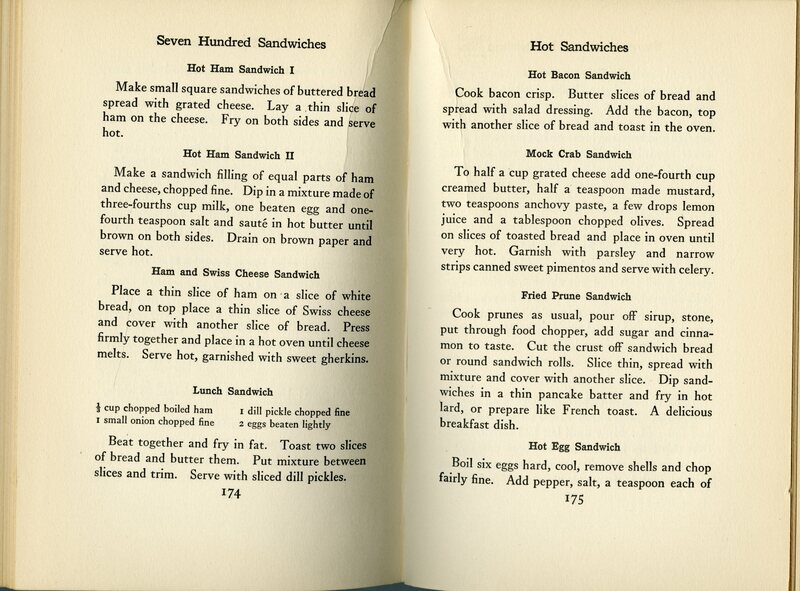 I made it about 10 pages into Seven Hundred Sandwiches when I realized that wouldn’t work. This book needed its own space. Thankfully, there are two Wednesdays left this month. That should be just enough this book and a little something special next week, too. 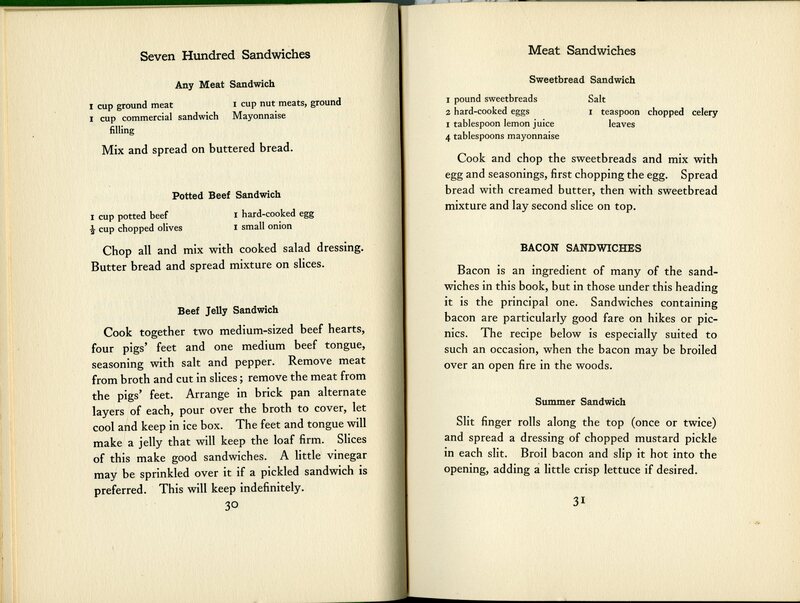 No matter what kind of sandwich you already like, you should be able to find something in this book…though you may not recognize it at first. 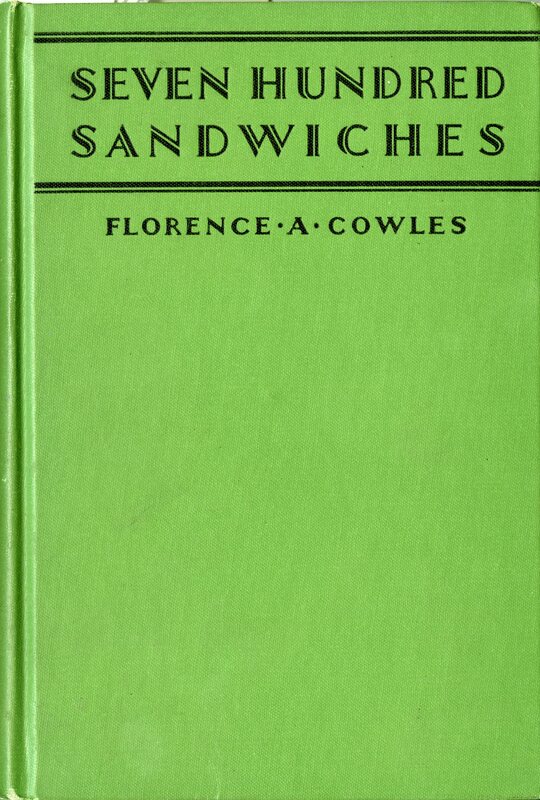 Throughout her volume, Cowles makes up names for combinations of fillings. And it’s definitely creative. 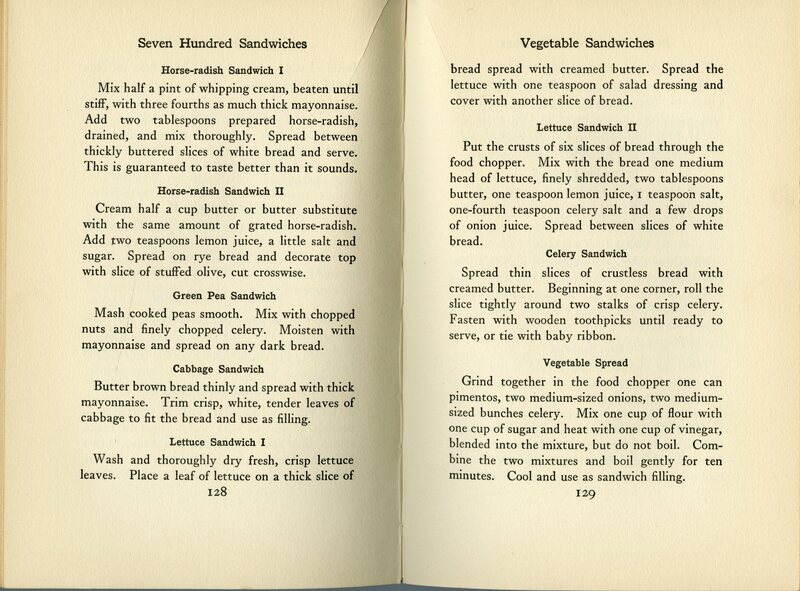 But first, the book opens with a set of general directions, in the event you’re new to this sandwich game: hints about which breads to use and how to cut; how to cream butter for spreading (it should ALWAYS be creamed before adding to bread); mayonnaise v. salad dressing; preparing a work space; preparing fillings; and storage. Like fish? How about a “sardinoil,” a “pimentuna,” or a “shrimpegg*?” If you prefer dairy, there’s the “creamango*”, the “tochebee,” or the “chilicot.” For nut lovers, there’s the “peanutpine,” the “gindanutra,” and the “prunuchee.” (I promise, I’m not making these up!) In most cases, the name is clue to the ingredients, as is their placement in a certain category. But a few just leave you puzzled without the recipe. Take a little time to ponder. There are a few sneak peeks at the bottom of the post, but if you have questions, just ask in the comments! 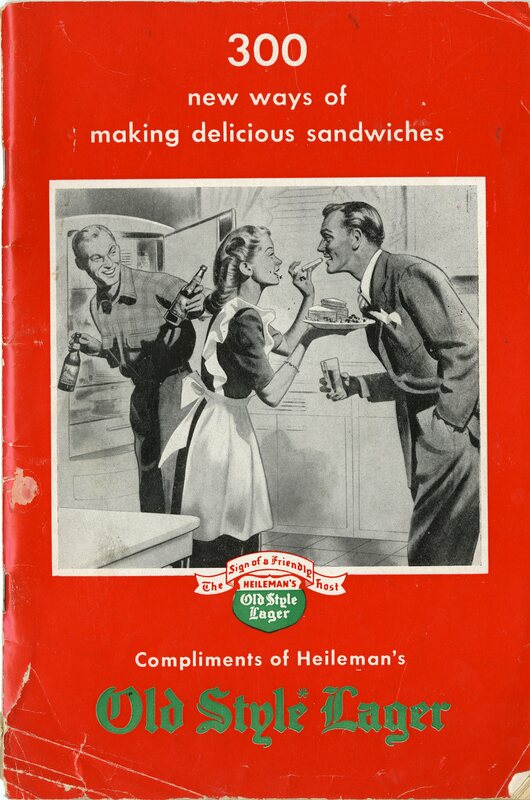 As an aside, the fact that this book contains TWO lettuce sandwich recipes did not escape my notice. Two that are actually different from the three in Mary Frazer’s 1903 Kentucky Receipt Book that continue to resurface! (You can see the original post here.) 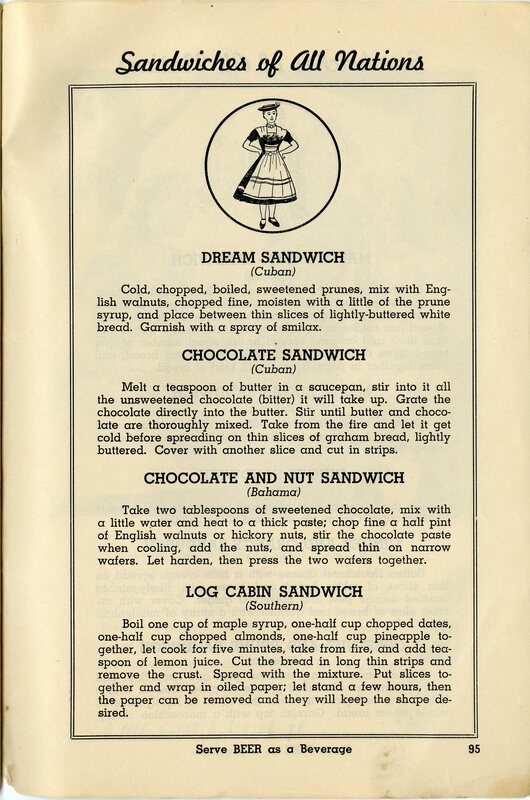 Lettuce sandwiches are nearly as common as frosted ones in our blog! 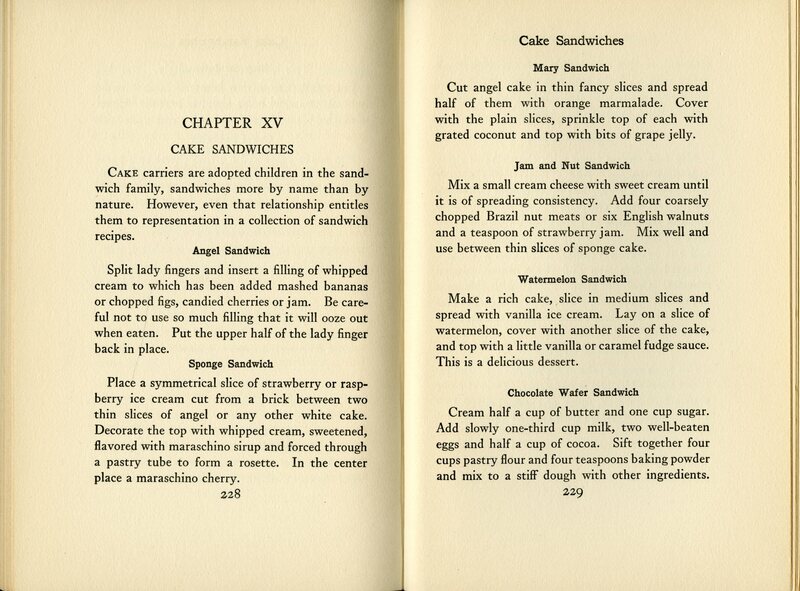 Florence Cowles spares us the frosted sandwich in her book, though she gives us a short list of “cake sandwiches.” You could create a four (or more!) 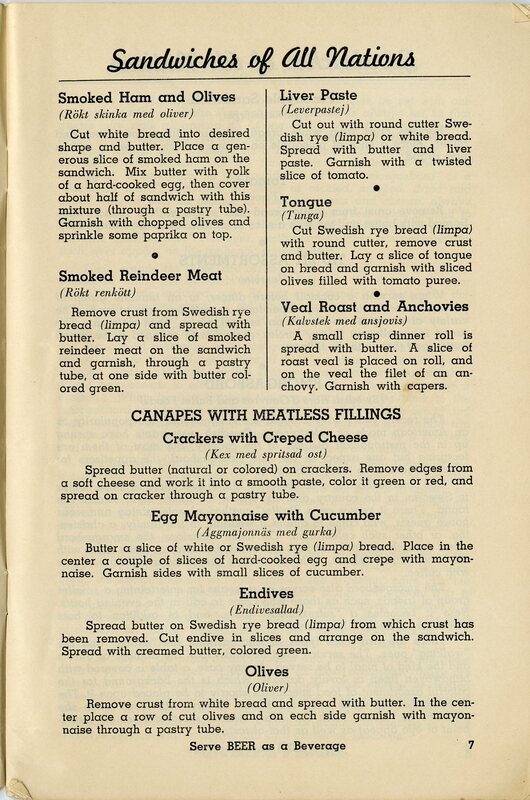 course meal of sandwiches with a little innovation: Russian sandwich canapes, Tomato soup sandwich soup course*, Lamb and Mint on wheat for dinner, and cake with watermelon and ice cream filling for dessert. And if you don’t like lamb, there are plenty of hearty beef, mutton, bacon, sausage, seafood, egg, cheese, nut, and especially ham, fillings instead. Shrimpegg Sandwich: A mix of cooked, canned shrimp, chopped walnuts, chopped hard-boiled eggs, and mayonnaise. Creamango Sandwich: A mix of cream cheese, chopped mango (peppers, not the fruit), onion juice, salt and pepper, spread on thin, butter-spread slices. Tomato Soup Sandwich: Rye spread with butter and undiluted tomato soup between lettuce leaves.